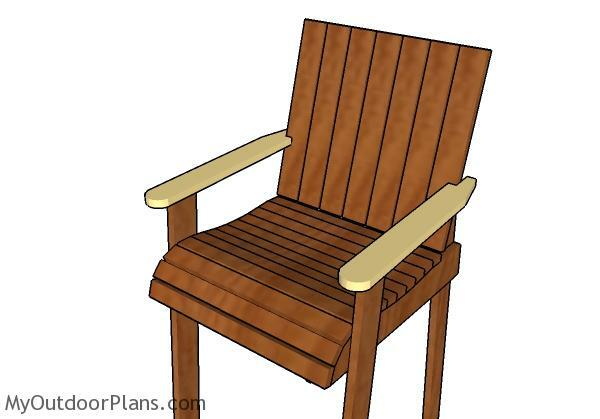 This step by step diy woodworking project is about bar height adirondack chair plans free. 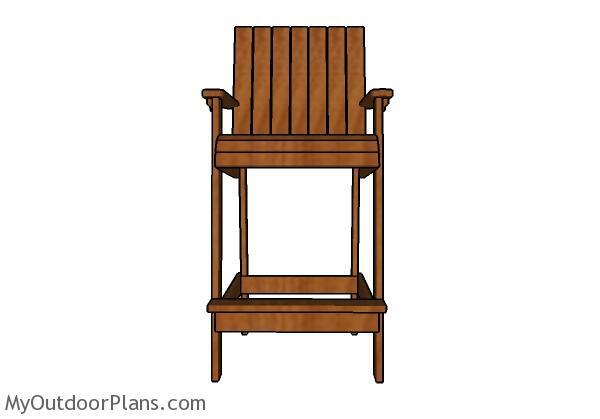 I have designed this tall adirondack bar stools, so you can add unique charm to your patio or backyard. This bar stools have a rustic appearance and there are super easy to build. Take a look over these instructions and make adjustments if you want to get a professional result. 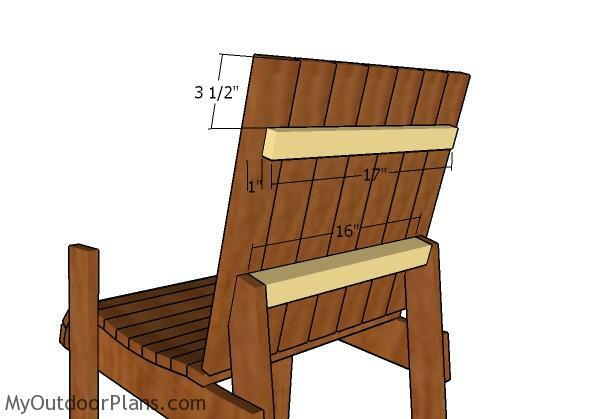 The first step of the project is to build the seat supports from 1×4 lumber. Mark the cut lines on the slats and then get the job done with a circular saw. Use sandpaper to smooth the edges. Next, you need to attach the 1×2 slats to the seat supports. You can adjust the size of the seat to suit your needs. Moreover, round the edges of the slats with a router before fitting them to the supports, for extra character. 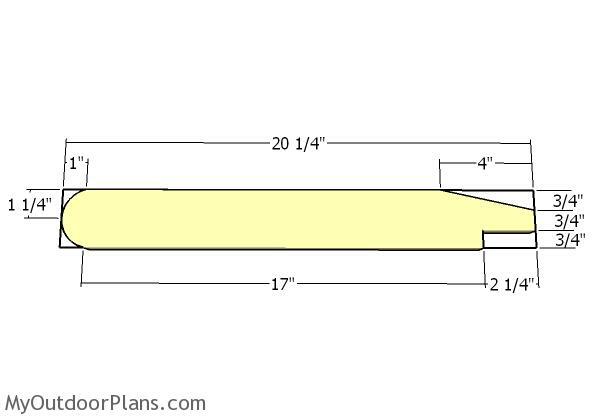 Drill pilot holes at both ends of the slats and insert 1 1/4″ screws to lock them into place tightly. Countersink the head of the screws for a professional result. 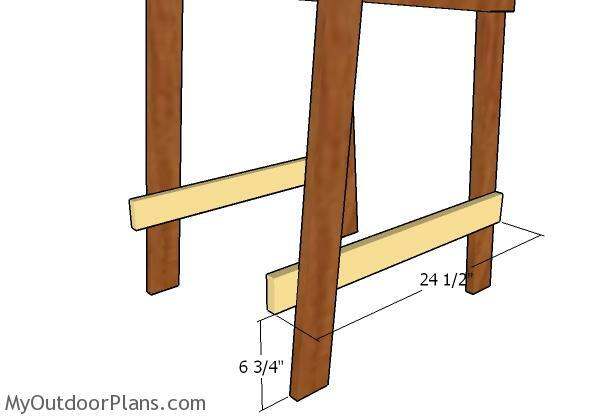 Continue the project by cutting the front legs for the bar height adirondack stools. 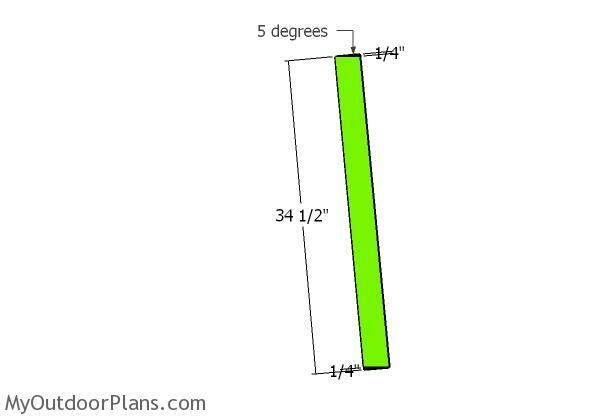 As you can easily see in the diagram, you just need to make 5 degree cuts to both ends of the 1×3 slats. Smooth the edges with sandpaper. 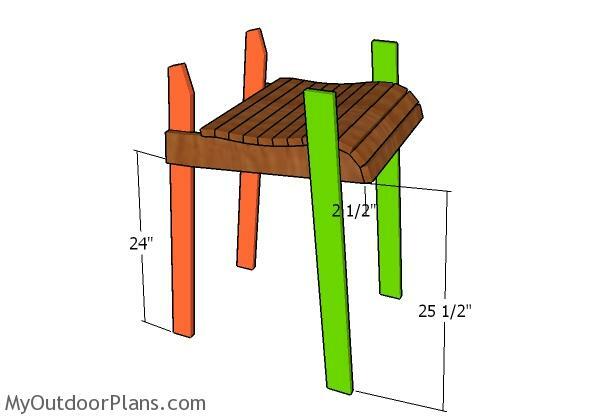 Build the back legs for the adironack bar stools in the same manner described above. However, you need to make some additional cuts to the legs, so you can fit them into place tightly. 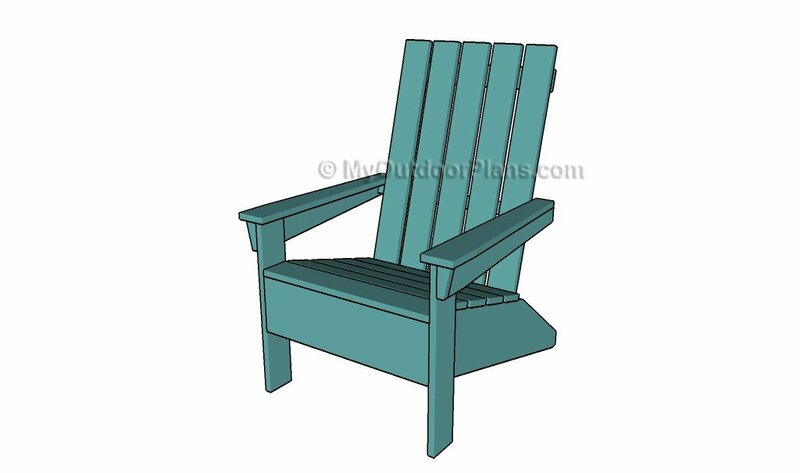 Fit the legs to the seat of the adirondack chair, as shown in the diagram. Drill pilot holes and insert 1 1/4″ screws to lock the legs to the seat of the chair. Add glue to the joints and align the edges. 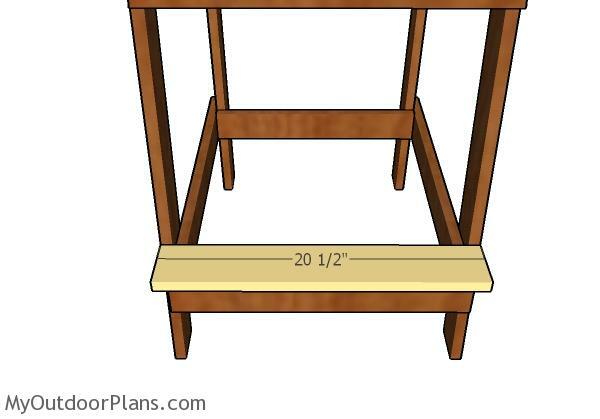 Fit the 2×2 support to the back of the bar stool. 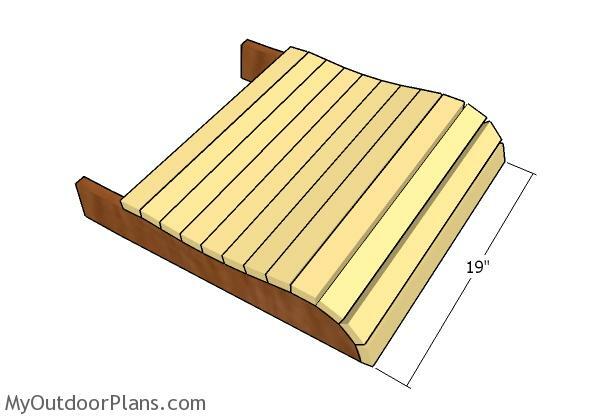 Moreover, fit the 1×2 slat to the top of the backrest slats, so you can secure them into place tightly. Drill pilot holes and insert 1 1/4″ screws to secure the backrest together tightly. 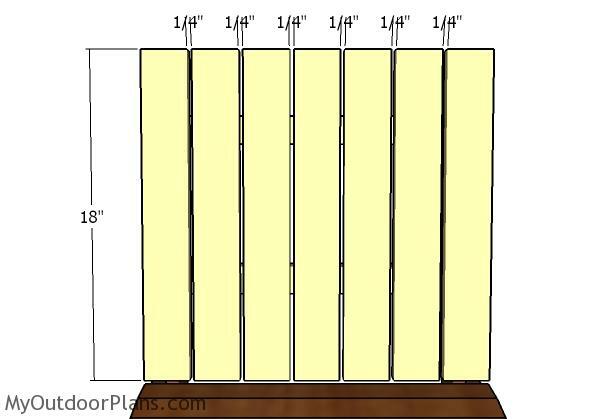 Fit a piece of 1/4″ plywood between the slats, so you can create even gaps. You can even round the top of the backrests, for an unique design. Fit the 1×3 supports to the base of the legs. Align the slats to the back legs, drill pilot holes and insert 1 1/4″ screws to lock them into place tightly. Fit the supports to the braces, as shown in the diagram. Align the edges flush, drill pilot holes and insert 1 1/4″ screws to lock them together tightly. Make sure the corners are square. 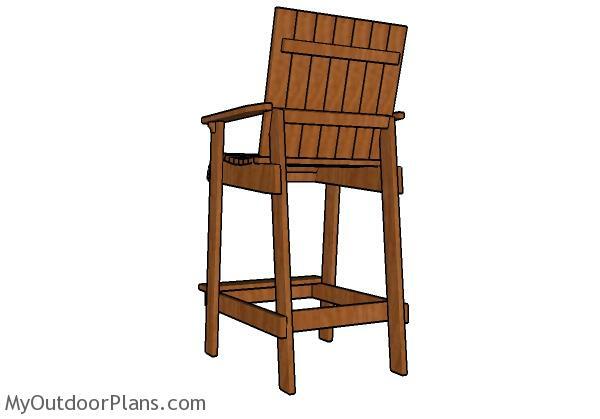 Fit the 1×4 step to the front of the adirondack bar stool. Align the edges flush, drill pilot holes and insert 1 1/4″ screws to secure it into place tightly. 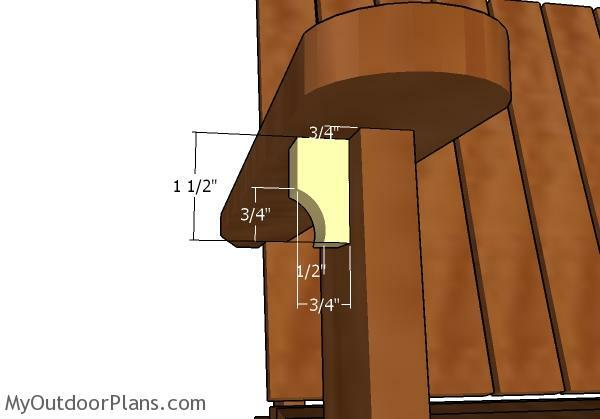 Build the armrests from 1×3 lumber. Mark the cut lines on the slats and then get the job done with a circular saw. Round over the edges with a router, for a professional result. 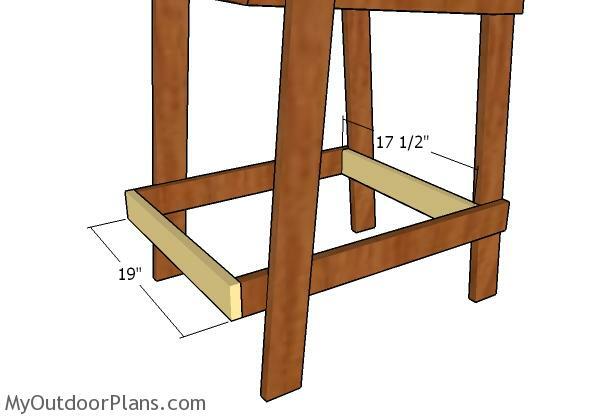 Center the armrests to the bar stools and then secure them into place with 1 1/4″ screws. 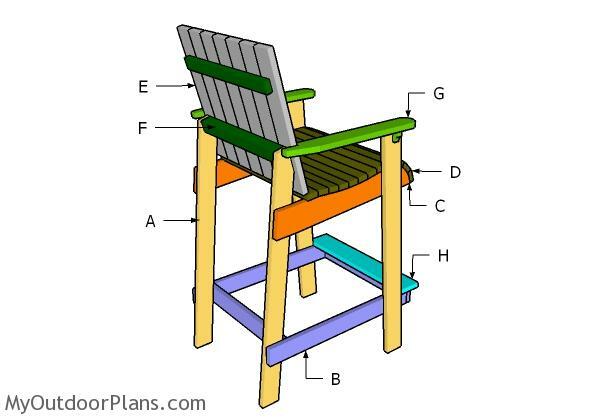 Fit decorative supports under the armrests, using the instructions shown in the diagram. Last but not least, you need to take care of the finishing touches. Fill the holes with wood putty and then smooth the surface with 120-220 grit sandpaper. 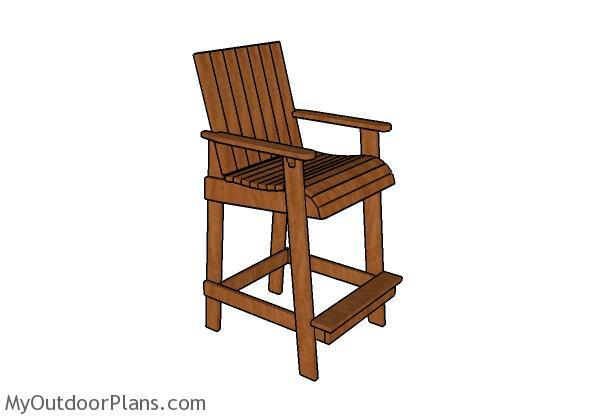 Apply a few coats of paint or stain over the components, to protect the wood from the lumber and to enhance the look of the chair. You can customize the look of the chair so it suits your needs. Smooth all the edges and use a router to round the edges with a router. 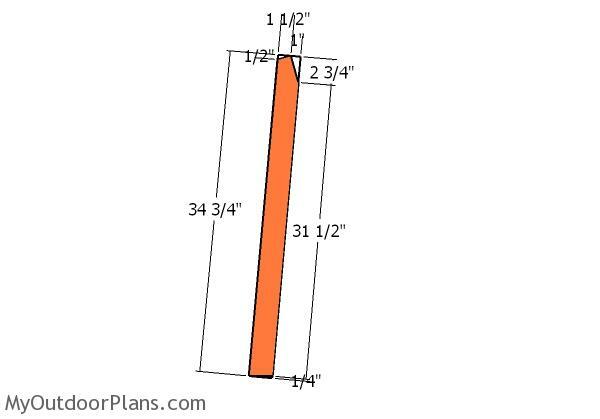 This bar height is a nice addition to any patio or home, as it features an unique design, while being very easy to build. I would love to see it, so don’t forget to share a few images! Top Tip: Don’t forget to take a look over the rest of my outdoor furniture plans, as there are so many designs and ideas you can choose from. This woodworking project was about bar height bar stool free. If you want to see more outdoor plans, I recommend you to check out the rest of our step by step projects. Taking to give this a try this weekend! 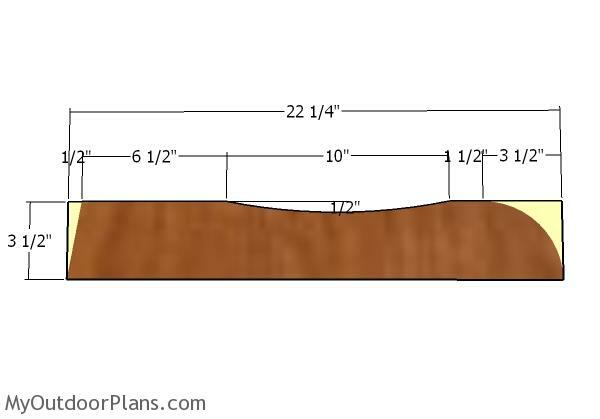 This will be my first wood working project. Glad to hear that. I hope the project comes out really well, so you could build more. Let me know how it comes out. I can t wait for you emails.They give me a good project to build on a regular basis. Thank you for the nice words. Looking forward to seeing your projects! Congrats for the project! Looking forward to seeing a few pics of your projects! 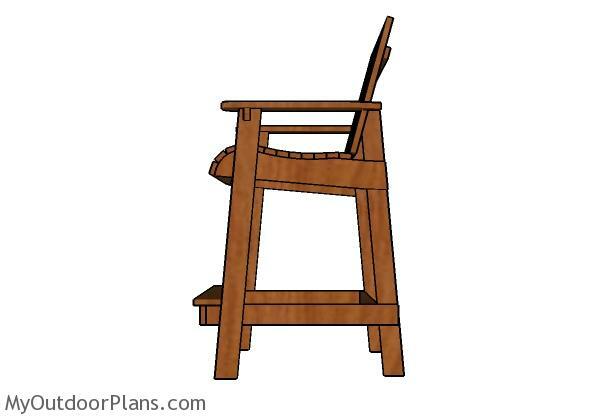 Hi…I am really impressed with this plan, I am brand new to woodworking and I really want to build this chair can you give me more info on doing the back fancier then the box look I like the scalloped look how much extra do I need to buy to cover the back like you did..